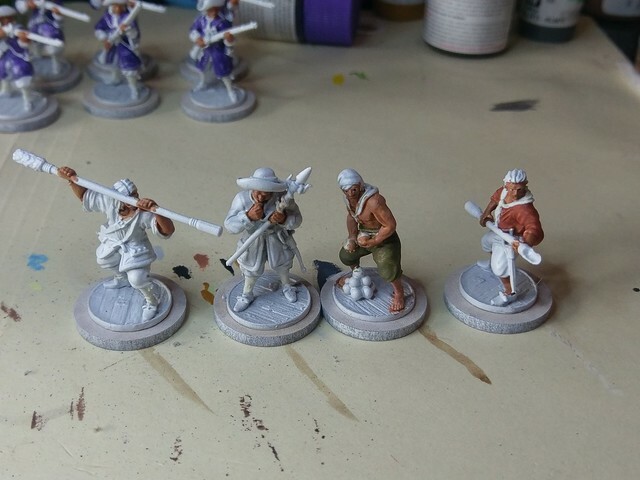 Most of my painting projects for the first part of 2019 will be creating a Dutch force for the Blood and Plunder game system. I participated in two Kickstarter programs and have a considerable collection of these minis. I have also made a (moderately binding) resolution to paint all the minis in my possession before I buy any new ones. 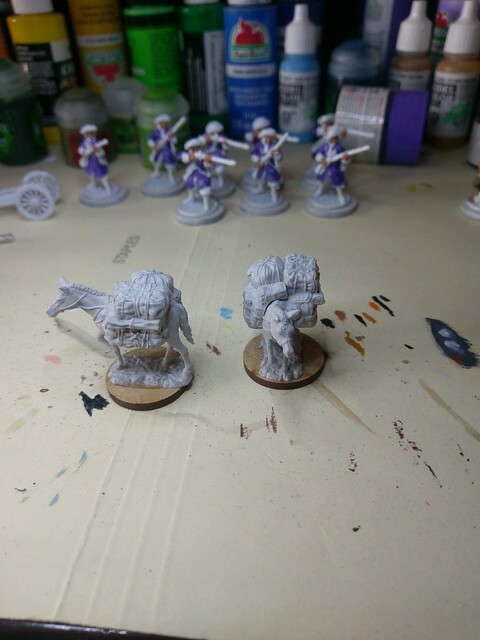 The Blood and Plunder minis are cast in metal, with an average amount of flash and mold lines. For the most part, details are good, but none of the minis are sculpted with eyes. Just a sharply concave depression in the face. My Twitter peeps suggested stating with the eyes, painting them in first, then painting the flesh color around them. For my first attempt at this technique I think they came out pretty good. I am starting with 15 minis, a Legendary Leader, Piet Heyn; 8 Soldaten, regular soldiers; 4 militie artillerie, cannon crew; and two pack mules (from WhizKids). 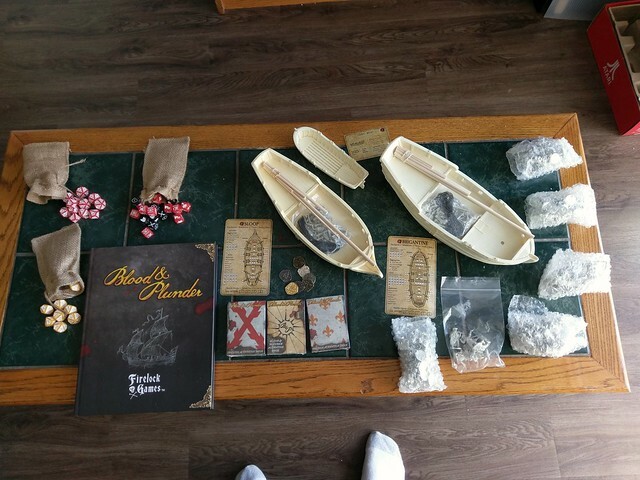 The Blood and Plunder minis are available from Firelock Games (who are also launching a new Age of Sail mini game). I have a couple of ships, and lots more figures to work on. Stay tuned. So I took a look at his YouTube channel, he has a ton of info there, and came across this gem. You can’t change the whole world, but you can change yourself and make your world better. It’s worth the five minutes. Not the marshmallow kind, but the kind of story or narrative that drives a game, where the backstory of the scenario is more important (to me, and, ideally to my opponent) than “winning” the game. I’d like to share a video with you, it’s not about miniatures, but it is about an interesting tool for making any kind of game more interesting – creating a mythology. I’ve been doing some of this for the Yangzee City Campaign, and will definitely be doing more! The Forge of Ice figures are available via DM on the FoI Facebook page. The complete catalog is found on the Lead Adventure website. 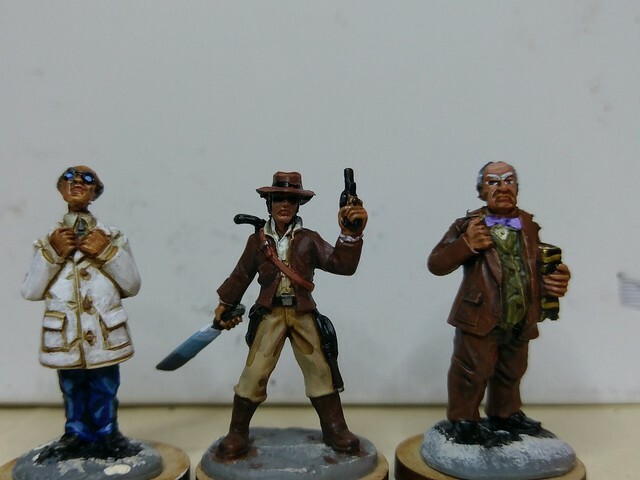 All of these minis are described in the previous three or four posts, check them out when you are ready to start working on your projects. After doing a bunch of searching, I found some models that might work for this set-dressing purpose. 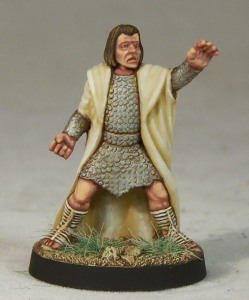 There are some Greek Civilians at Warlord Games that might work. Gripping Beast Civilians might work, less “Roman”, though. As you pass through a small Lemurian village, it is attacked by savage highland raiders! Without your help, the villages supplies (and children) will be carried off! Zdenko Cerny and a handful of scientists have been working day and night to find a way to save Lemuria. Based on what they learned from ancient Lemurian tablets, a handful of repairs deep in the Underneath is the key to stopping the flooding. 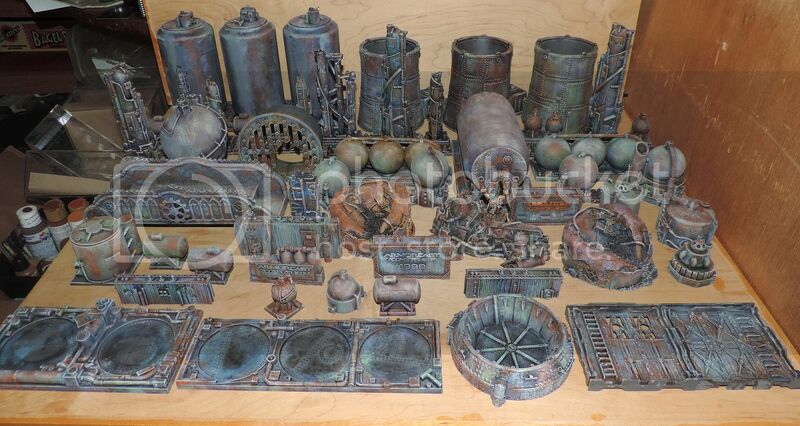 This is one of the more terrain-intensive scenarios, requiring a great deal of construction of Necromunda-style terrain pieces. This scenario features as its centerpiece a large villa in which the Prince is being held. If you have the wonderful Rick’s Place from Sally 4th, you could use that as the basis of the villa and only have to build a few small pieces to make the interior rooms. Rick’s is only 16″ x 12″, so you’d also need to build two more exterior wall pieces. 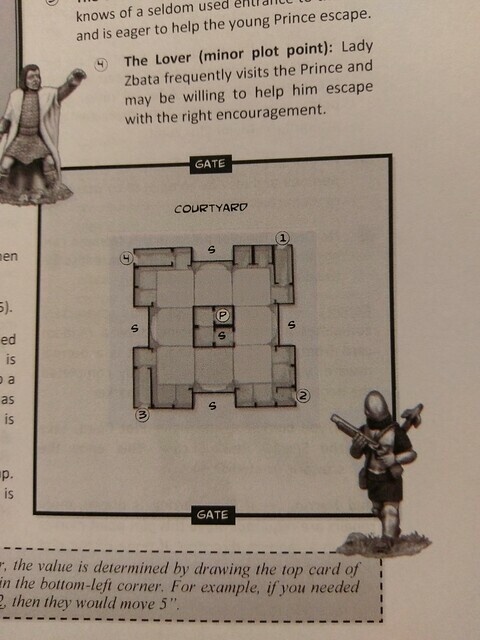 This completes the listing of what is needed for you to play each of these scenarios in the Lost World of Lemuria. Next up, I’ll be putting together an order guide for Forge of Ice and Antediluvian Miniatures. I can’t wait to start on this project! Let’s get cracking! Costumed revelers fill the streets during the annual celebration. Amidst the wild dancing and raucous feasting, the nobles whisper and plot behind brightly colored disguises. This is a Social Affair scenario, so there is no Brawling, Shooting, Running or Dodging, nor can any Bursts be placed on the table. I have played a couple of Social Affair games at Cons and they are a lot of fun, as they require a different approach to winning. They also have the benefit of the Dirty Tricks rule, which is a hoot. I haven’t figured out which models to get for some of the Plot Points and NPCs, but I do recommend the more the merrier! 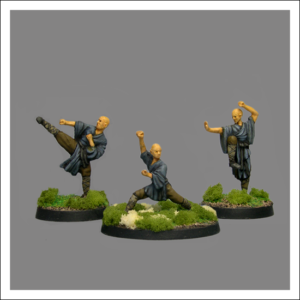 5 x Mpamono Monks (CP Miniatures has some good ones). Put them on 3″ diameter bases, as that is the range they are extremely perilous. The Forge of Ice catalog is here. There are four scenarios left to catalog, and three of them are going to involve some serious terrain-building. Stay tuned, and as always, C&C welcome. In addition to these special pieces, you will need some trees, foliage, or fish tank plants of some kind to use as Scatter on the board. 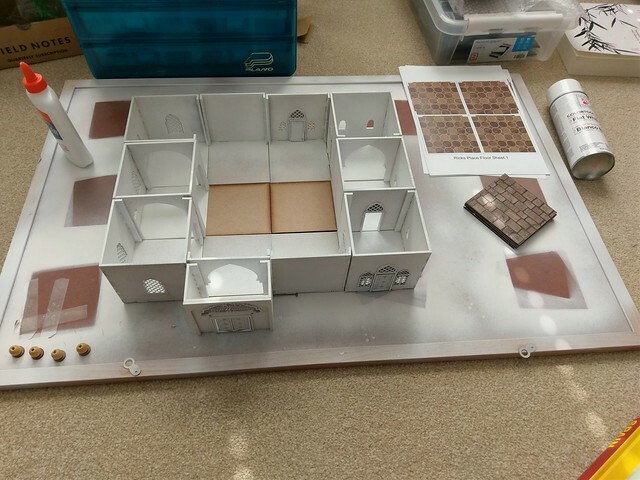 Keep in mind that the game board size is based on a 3’x3′ space, so the recommended amount of terrain features is 6 to 8. The character cards in the back of the campaign booklet have pictures of these creatures. I am going to be grabbing some “search engine” results and making paper cutouts to represent these monsters. As soon as they are completed I will share the PDF here. I-d recommend re-sizing the roof piece, and using some cardstock to make the pitch less, so your models can stand on it. More scenario material lists coming soon! Three weeks ago my Lovely Bride got a new job, in Charleston, SC. So last week we put our stuff in storage and moved to Charleston. We’ve been thinking about this for a while now, we really love Charleston and have visited many times. We are looking forward to this new adventure. We found an apartment near the hotel, waiting for the application process to work through. There isn’t any hobby info for now, and probably not for a while as I look for a new job. With any luck I can find a restaurant that is as fun and rewarding as Jaleo. Since I do have a bit of time on my hands now every day I will think about doing some more frequent blogging. What should I write about? Any suggestions?